The first of the Shenmue III images shows a shopping street in Choubu at night. 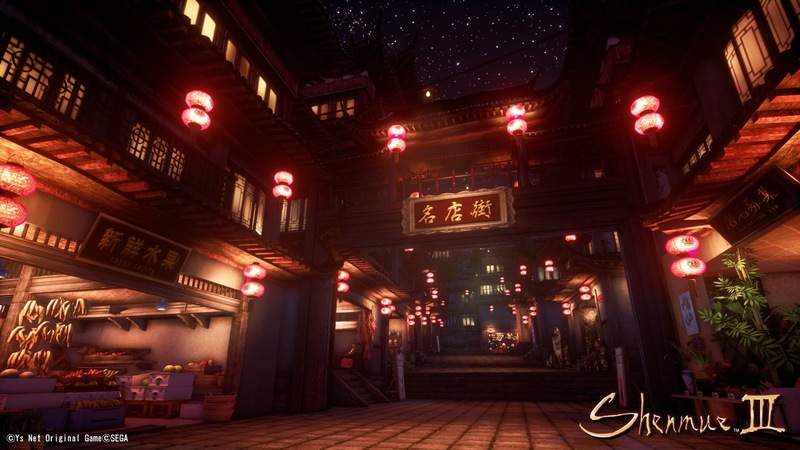 Above: a star-studded night sky; below: glowing red lanterns along the shopfronts line the street. Choubu shopping street at night (click to enlarge). At the left, fruit such as pineapples, bananas and watermelons can be seen displayed for sale in trays and boxes. A signboard above the shop advertises "新鮮水果 / FRESH FRUITS". (While the individual written characters are found in both Japanese and Chinese, the word for "fruit" is one that is found in Chinese only). The shop on the right has a number of ornamental potted plants for sale. The signboard above the entrance reads "店名募集 / ten mei bo syu". 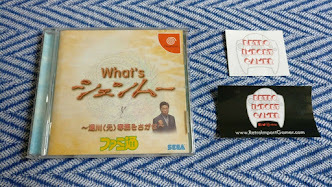 This is Japanese (the words below are simply the pronunciation), and its meaning suggests it is a temporary placeholder put there by the development team: "Shop Name Wanted". 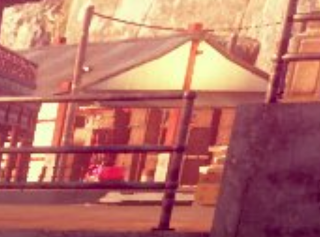 Screenshot from Kickstarter Update #74: a"Shop Name Wanted" sign also appears above the entrance of this shop at the right. The purpose of these unnamed shops is most likely related to the "Name a Vendor" Kickstarter reward, where backers who pledge at the $4,500 reward level get to have their own name incorporated into the name of a shop. 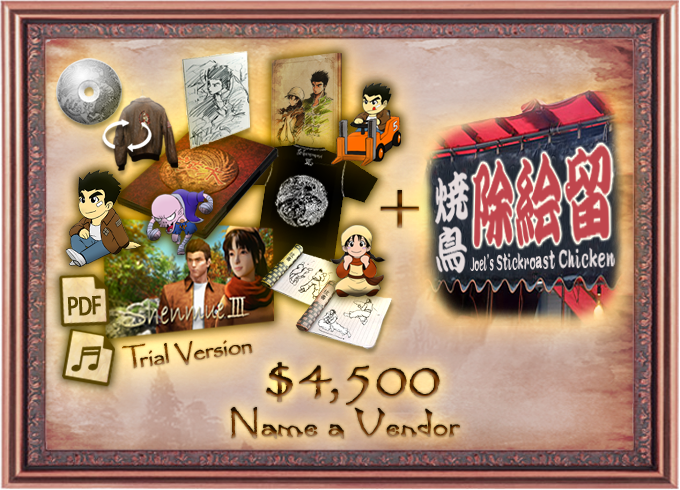 "Get to name a street vendor in the Choubu area. 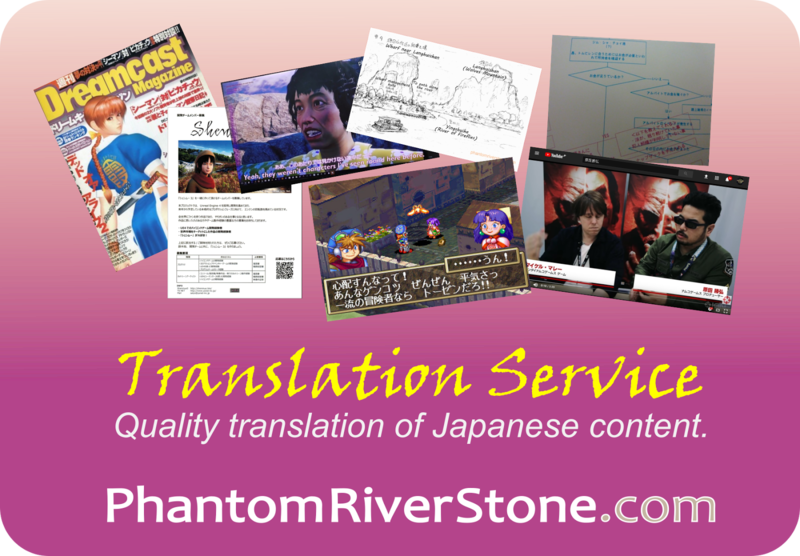 Once Yu Suzuki approves your name, it will become vendor’s sign in Chinese and English. Could you be the next Bob or Tom? 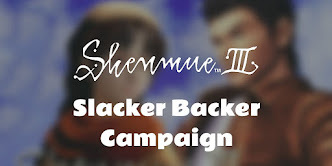 Thanks to Shenmue III super-backer George Kitchen for suggesting the reward connection! The large sign above the center of the street, attached to the gateway, holds the name of the shopping street: "名店街" - literally, "Shopping Street of Well-known Shops". "Shopping Street of Well-known Shops"
The phrase "Well-Known Shops" in Japanese, although clunky when translated literally, usually refers to the shopping heart of a town where the shops are well-established but not necessarily famous in the conventional sense. A more natural-sounding in English might be something like "Main Shopping Quarter" or similar. The words on the sign can be read properly as Japanese, but (as far as I can tell with the help of online translation tools) do not appear to be well-formed Chinese. 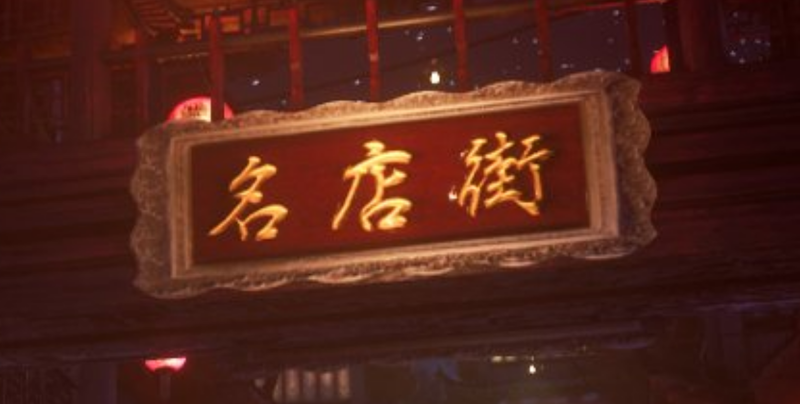 If there are any speakers of Chinese reading the blog, it would interesting to know whether the written sign above also represents meaningful Chinese. 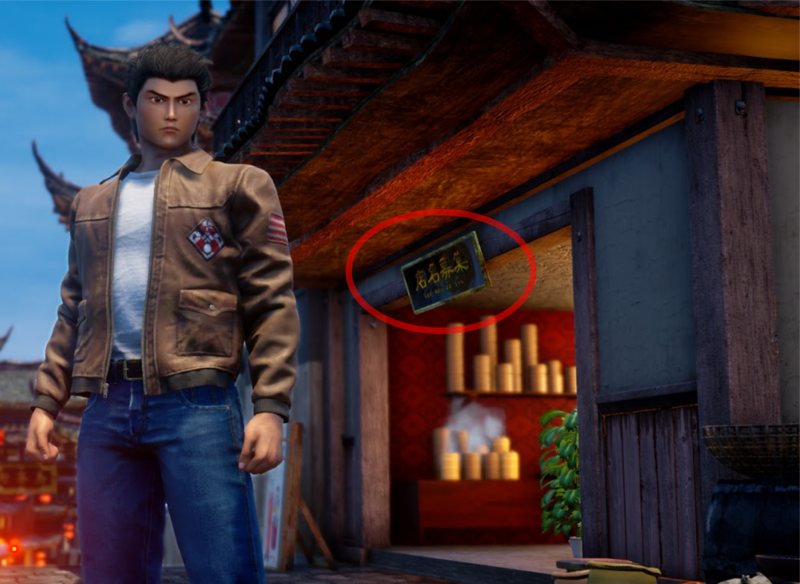 Update: blog reader O Rei do Frango Assado has confirmed in the comments that the words on the permanent signs (excluding the "name wanted" placeholder sign) are also proper Chinese. Thank you for the confirmation! The second image shows the Chobu waterfront as a sunny day turns to evening. 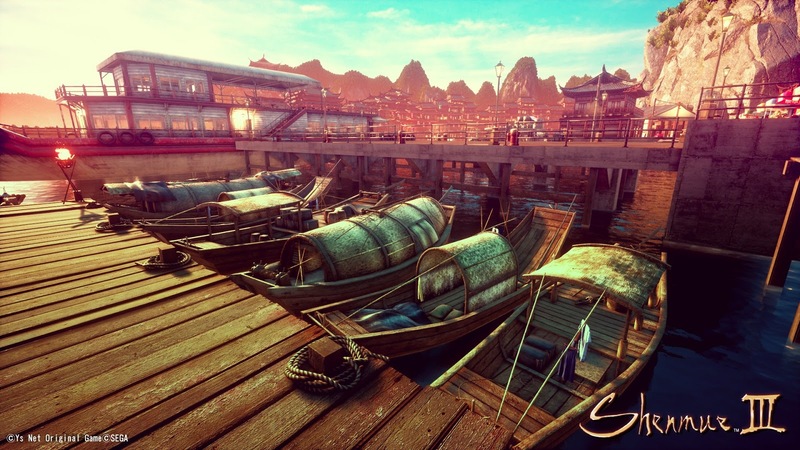 There is some wonderful detail in the textures such as the wooden planks and ropes, and good depth of background with numerous buildings and the distinctive Guilin mountains behind. The concrete pier with its iron railings, which serves the large riverboat, looks quite modern compared to the lower wooden wharf. Choubu waterfront (click to enlarge). Detail: end of the wharf. The highlighted area can be recognized from the Gamescom 2017 teaser video. 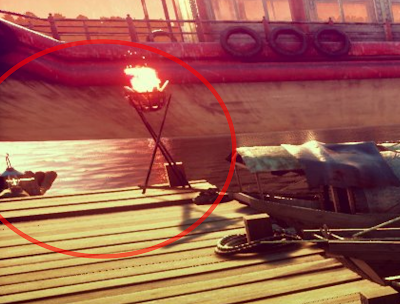 This part of the wharf has been seen in the teaser video released at Gamescom 2017, in the clip showing Ryo undergoing some kind of training with an elderly man on some kind of bamboo raft - the tip of its distinctive curve can be glimpsed in the circled area in the image above. From the Gamecom 2017 teaser. Ryo undergoes training on a raft next to the same area of the wharf. 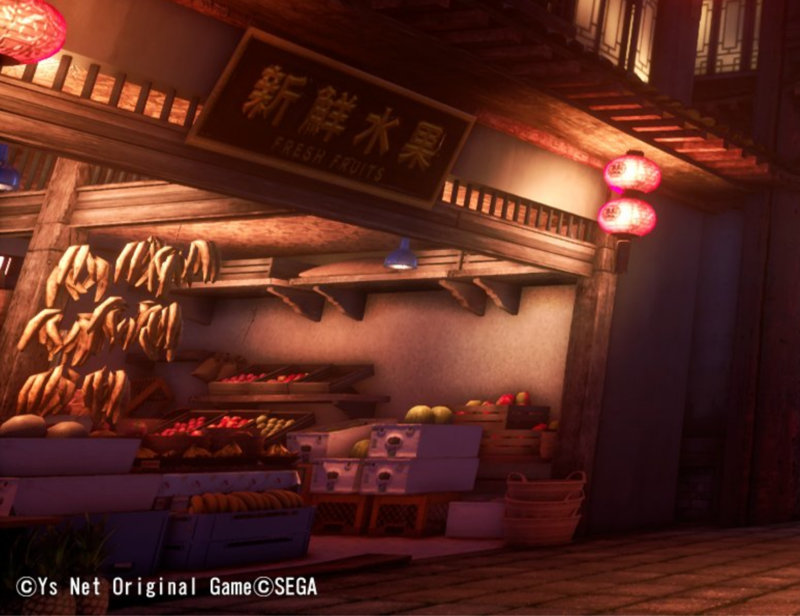 Now, Yu Suzuki has dropped hints about wanting to include forklifts in the game as a fan service, and more recently confirmed that they will be present in some form (most recently, during an August 2017 interview with Famitsu he said "Forklifts are being readied"). It would seem there is a good chance a warehouse in Choubu may offer this opportunity - whether any interaction with them will be possible is another question to ponder on. 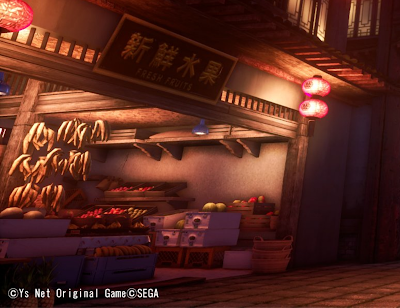 The last image shows Shenhua and Ryo walking closely together along a path. 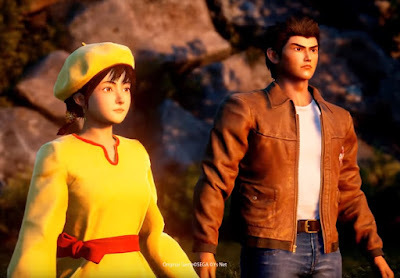 The evolution that can be seen with the character models is notable, particularly for Ryo. And furthermore, facial expressions also now appear be in play; Ryo's usual determined frown is quite mellow in the above image. While we don't know if these are the very latest iterations of the models, Yu did comment in the recent Kickstarter Update #78 that he is at last satisfied with the model for Shenhua. The Shenhua and Ryo models from the Gamescom teaser. The background in the image can also be identified. Two pieces of rope can be seen hanging vertically behind Shenhua, as the pair pass in front of the immense trunk and roots of a tree. This of course points to the Shenmue tree outside Shenhua's house, with the swing hanging from it and petals drifting down in the breeze. 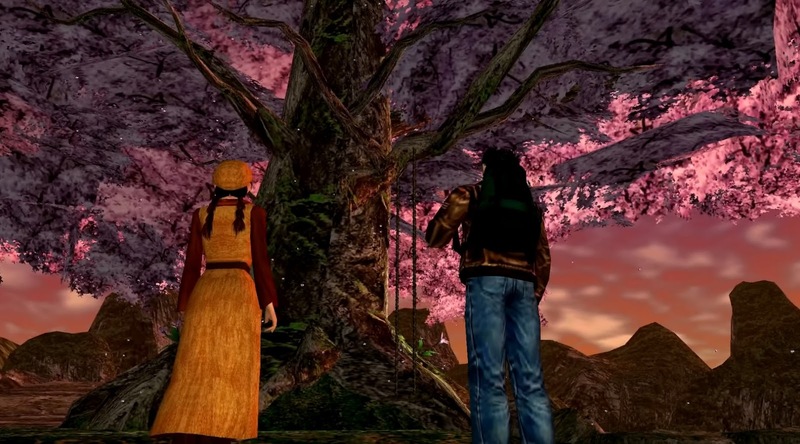 The Shenmue tree as seen in Shenmue II. Prize for Detail Detective goes again to Spaghetti here for noticing one further subtle clue buried in the image which clinches the matter. 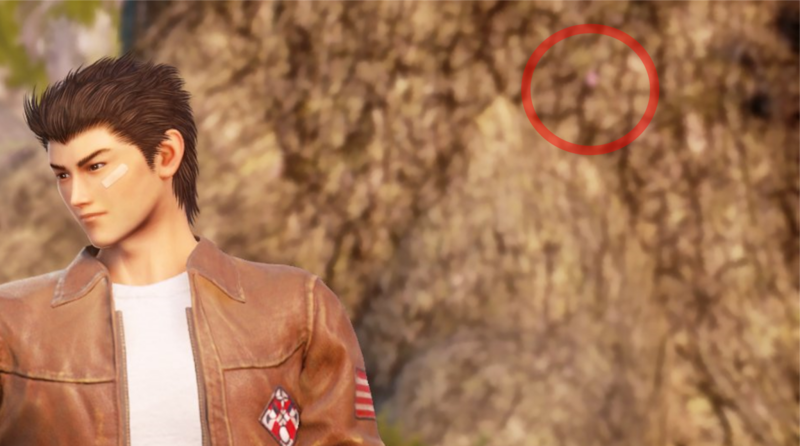 If we examine the tree trunk very closely - behold, a small pink petal. Getting three new images at the press conference was an unexpected bonus. So what can we expect at the actual MAGIC 2018 event itself? 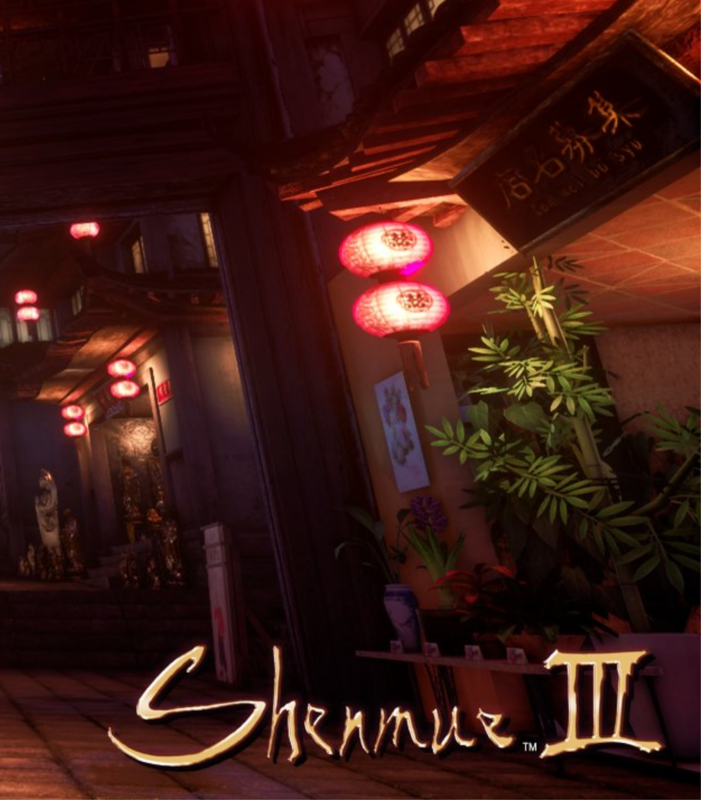 According to a tweet from journalist Romain Mahut, who attended the press conference, "Cedric Biscay promises new images and new details on the gameplay of Shenmue 3". 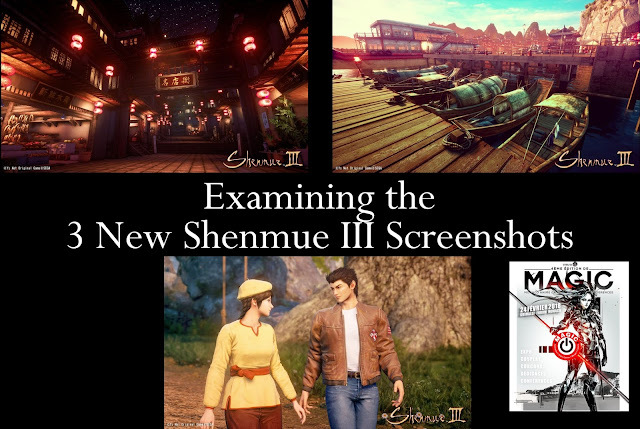 While only "images" are mentioned, Shenmue fans will be hoping that there will be some kind of video clip or trailer. With the event coming up on February 24th, we do not have long to wait to find out! 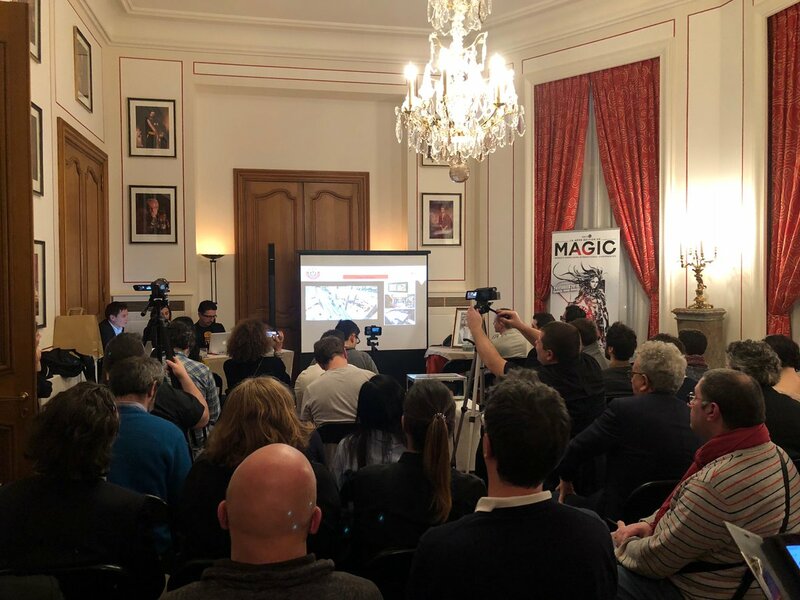 Update: confirmation has been received that we will be able to see Shenmue III "in motion" and a lot of content at MAGIC. (Source: press conference video recorded by Shenmue Master. Thanks to Dave Col for translating & highlighting this!). What did you think of the new images and character models? Share your thoughts below. Beautiful images! And very nice description and annalises. Nice work Switch. As allways! Thanks Joel! I agree, the images are stunning. It's exciting to think of what more we may get to see of these areas at MAGIC. Brilliant as always, Switch. Thank you. Can't wait for Magic Monaco. Hey Iyapol, I'm with you on that: let the countdown begin! Have we had an official word on the reason for Shenhua having different clothes compared to Shenmue II? I don't mind, it just seems like an odd thing to change without a reason. About the S3 image we have seen of her with Ryo in the cave in a new costume, it can probably be considered work in progress so I'm assuming her costume for that scene is going to be revised back to the one in S2 for consistency. Thanks, Switch! This might be a question about culture more than language/translation, but I was wondering about the name "Shopping Street of Well-Known Shops." Is this a believable name for such a street, or is it more like a placeholder name? Hi Centrale! I think the intention is for this to be the proper name. As you can probably tell, "Shopping Street of Well-Known Shops" is a very literal translation but it sounds fine in the original language - this kind of naming is not unusual in Japanese. 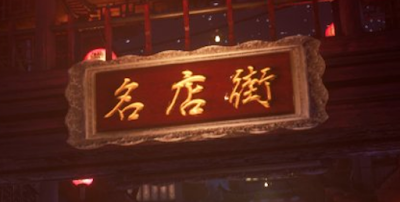 There is still room the possibility of it being changed however, which would be if they decided to write all the signs in Chinese rather than Japanese (a topic for a whole separate discussion!). Post updated: I've made a couple of extra notes to the post. 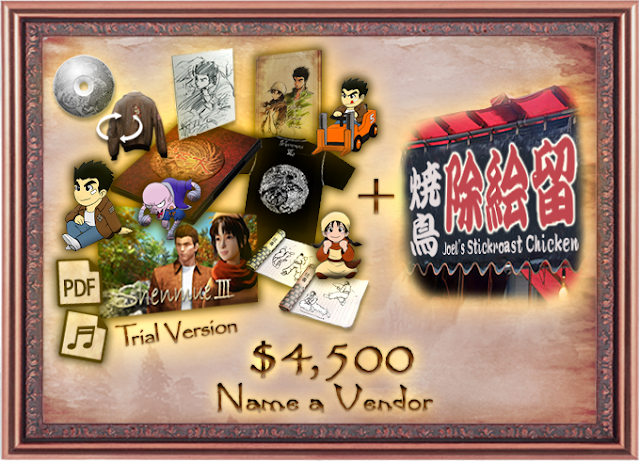 One is the likely connection of the "Shop Name Wanted" sign with one of the backer reward tiers, plus a comment about a translation for "Shopping Street of Well-Known Shops" in English. Fascinating read as always. Can’t wait to see footage at MAGIC. No point commenting on WIP character models - slowly but surely they are getting there. Yes, the characters in particular certainly have undergone many changes but it's good that Yu feels that they are starting to reach something he is happy with (in the case of Shenhua, specifically). I hope that Yu will tell some release-dates for the Trial and the full game. And when the Slacker Backer Campaign ends. The characters looks now far better than on the gamescom-Teaser. The landscapes looks awesome. MAGIC will be great. Great work, as usual, Switch! As for both 新鲜水果 and 名店街, those are perfectly good Chinese, I'm glad to say. 店名募集 is definitely Japanese (even without the romaji), but, as you said, that's obviously a placeholder for the devs, so, no problems there. Ah, thank you very much for confirming! 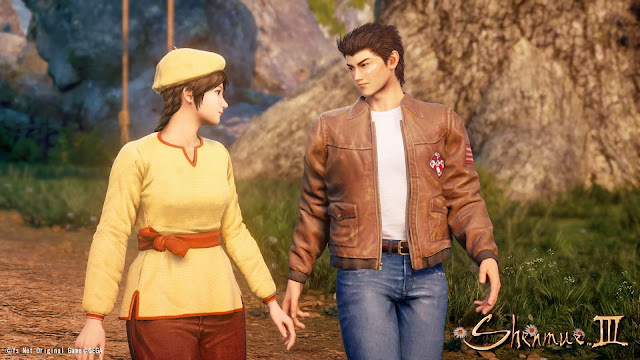 I'm relieved to hear they are both proper Chinese, as it wouldn't feel right for them not to be (putting aside the ongoing situation of everyone speaking Japanese within the game, of course!). Just love your love/job towards Shenmue....so much detail....Here and the Dojo are the best Shenmue related sites to look. Keep up the pace!! PS: Cant't wait the event it self!!! Many thanks! I think we're going to be blown away by the presentation at the main event!